A few minutes ago I was skimming through a website that advertises job openings in church ministries. Among the fifteen or so positions listed on the first page were “Creative Arts Director,” “Media Specialist,” and “Pastor of Creative Arts.” My sense is that, a generation ago, a similar (though non-internet!) search probably would not have turned up any of these particular job titles. For the Beauty of the Church – a fine new collection of essays edited by David Taylor – reflects the two realities I’ve just described. On the one hand, the very existence of the book points to the growing prominence of arts ministries in the American evangelical church. On the other hand, the essays in the book remark, over and over again, that this is in fact a new development. A number of the contributors, for instance, describe the ways in which artists are still overlooked and undervalued by the church. Others recall their own first faltering steps as they attempted to incorporate the arts into the ministries of the church. They had few models and few mentors to whom they could look. We should be grateful, then, for this volume. There is in fact a new interest in the arts, and so there is also a real need for pastoral wisdom and theological reflection to guide that interest. Taylor’s book addresses this need and provides an ideal starting point for those involved in or preparing for some sort of arts ministry. Actually, “pastoral wisdom” is a good way to characterize the book as a whole. While it is theologically informed, it is not an academic theological treatise. And while some practical advice is given, it is not a step-by-step, “how-to” book. Instead, the eight essays in the volume engage in reflection, but reflection firmly rooted in the life of the church. Very helpfully, Taylor recognizes that the life of the church has many different dimensions and includes people acting in many different roles. The essays reflect this diversity of activities and participants. Individual chapters consider the arts in relation to the gospel entrusted to the church (Andy Crouch) and the worship enacted in the church (John Witvliet). They explore the dangers that attend arts-based ministry (David Taylor) and the future of the arts in the church (Jeremy Begbie). Other essays approach the arts and their role in the church from the perspective of the art patron (Lauren Winner), the pastor (Eugene Peterson), the artist (Barbara Nicolosi), and the practitioner (Joshua Banner). Taken together, the essays comprise a rich, many-voiced conversation. Each chapter is engaging and readable. Each has some helpful insight to offer, and the best of the bunch should be essential reading for those involved in arts-based ministries. To mention just a few of my own favorites: John Witvliet, in an essay marked by great clarity and wisdom, outlines principles that should characterize liturgical art. Lauren F. Winner recognizes that the art world is often one associated with privilege, and she writes with sensitivity and insight about the ethics of spending money on art. Eugene Peterson shares stories about three artists he has known and reflects on how these artists helped form his own sense of vocation as a pastor. And in an eloquent and theologically rich essay, Jeremy Begbie considers the future of the arts in the church, in light of the subversive and re-creative work of the Holy Spirit. If, however, the collection reflects some of the wisdom the church has gathered concerning the arts, it also provides evidence that there are still issues to be thought through. Two of the essays in the collection, for instance, insist that the essential character of art is that it is “useless” (Andy Crouch); that it “isn’t for anything” (Barbara Nicolosi). Two other essays however – those by John Witvliet and Lauren Winner – argue against this common association of art with uselessness. Far from being a “purely academic” difference, these different ways of understanding what art is lead in fact to different visions of what art should be in the life of the church. Another example: in some essays, contributors attempt to make amends for the church’s neglect of artists by extolling artists as a uniquely gifted class of human beings. (Artists are uniquely insightful, uniquely sensitive to spiritual truth, uniquely responsive to meaning, and so on.) Artists, Barbara Nicolosi believes, “genuinely perceive spiritual realities,” which they then try “to get through to the rest of us” (118). In other places, essays encourage pastors to be patient in shepherding artists, because artists are (of course) brilliant but moody, creative but scatter-brained, sensitive but quirky, passionate but eccentric. These characterizations, however—the Artist as High Priest of the Human Spirit and the Artist as Brilliant-but-Tortured Eccentric—are far from universal, timeless descriptions of creative people. Instead they echo a certain 19th-century Romantic vision of the Great Artistic Genius. Of course there are artists who fit these stereotypes. On the other hand, there are moody auto mechanics and creative, spiritually perceptive kindergarten teachers! I’ve also known Carnegie Hall-caliber musicians who—as human beings—were about as quirky and passionate as wallpaper paste. The point is, in order to think theologically about the arts, we need also to reflect carefully upon what art really is. We should welcome the arts into the life of the church. We should not, however, uncritically welcome every cultural stereotype about the arts. 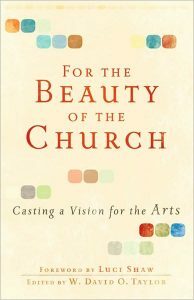 The essays in this book arise from a 2008 conference entitled “Transforming Culture: A Vision for the Church and the Arts.” As the title of the conference indicates, the church should not only participate in culture, but also transform it – and that includes our culture’s conceptions and misconceptions about art. At many points, For the Beauty of the Church engages in just this sort of transformative reflection. At every point it encourages the rest of us to continue in such an engagement, and it provides us with resources to do so more thoughtfully and faithfully.